Abdul Halim Perdanakusuma is a national hero whose name is enshrined into the name of the airport in Jakarta Halim Perdanakusuma named airport. He was born in Sampang, 18 November 1922. 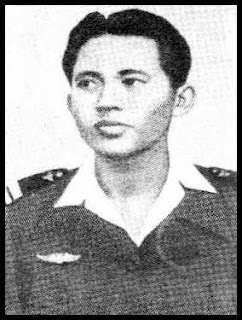 He died while performing their duties during the war Indonesia-Dutch in Sumatra, when commissioned to buy weapons and transport supplies by plane from Thailand. Maintain the independence of Indonesia during the war against the Dutch in Sumatra in 1948. Halim Perdana Kusuma and Marsma Ismayudi completeness assigned buy guns in Thailand. Both were assigned to the aircraft type Enderson. Aircraft was filled with a variety of firearms. karbin them. sten-gan. hand gun and bomb. On the way home the plane crashed. No known cause. Allegedly kerana bad weather, but possibly because of sabotage is very open. Wreck of the aircraft was found in a forest area adjacent to the Lumut Perak Malaysia. But rescuers only found the bodies Halim. Meanwhile, Ismayudi not found and his fate is unknown so now. So also with various firearms completeness they buy in Thailand, it is unknown where it goes. Halim's body was later interred at Mount Meshach. not far from Gopeng Perak Malaysia. Data Center Leaders Indonesia recorded in the area (Mount Meshach) many Sumatra, a few years later his grave was exhumed and his body was brought back to Indonesia and was buried in the Heroes Cemetery Kalibata. Jakarta. Government pays tribute on services and the struggle Halim. to bestow the title of national dahlawan and perpetuate his name in an aerodrome (airport) at the Jakarta Halim Perdanakusuma internationally. Also with perpetuating his name on the warship KRI Abdul Halim Perdanakusuma. Temporary. Ismayudi fate is unknown. When the agreement between the Royal Malaysian Haadyai the Communist Party of Malaya in 1989. Indonesia also appeared in a ceasefire. Ishak Haji Mohamad (Pak Sako) Indonesian citizen is suspected communists is Ismayudi.